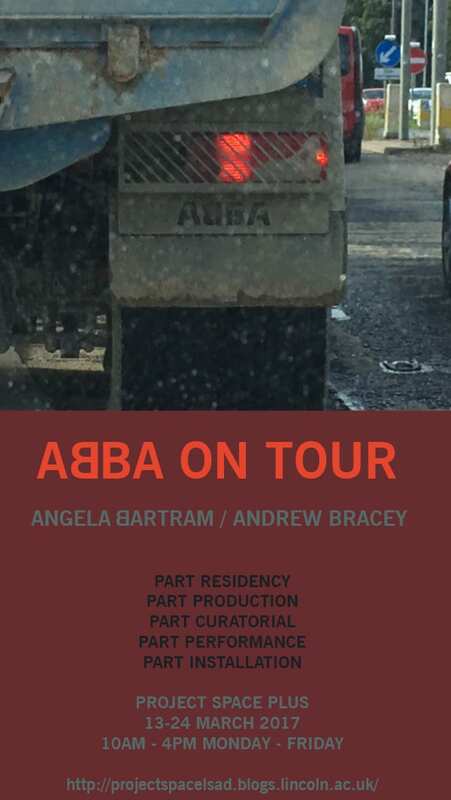 ABBA is the curatorial and artistic collective of Angela Bartram and Andrew Bracey, two artists engaged with the act of making and process with divergent outcomes. ABBA seeks to create a conversation of interrogative and inquisitive practice born of doing. The maker is saturated in the environment of exhibition and debate: the event is part residency, part production, part curatorial, part performance and part installation. This is live artistic research: talks, actions, artefacts, deliberations, provocations, ruminations, speculations, invention and creative assembly, process and production will be present. The artists will be present in the gallery in the first week of the exhibition and everyone is welcome to come and engage with ABBA. The exhibition in turn acts as a dialogue between venues. As it moves to the next it will regroup, restage, and reproduce the process in respect of site and circumstance. This is the pilot for the tour of this exhibition, which aims to respond to the letters in the title – A, will be in a city beginning with A; B in a city begging with B; the final B and A in a city that has a backwards writing style. Like a band on tour and with a set list defined by the performers the show will naturally change, mutate and draw in other participants, but the core principle of making and process remains integral.